Tommy Cummings will long be remembered as a member of the Burnley team that lifted the Football League Championship in 1960, the oldest member of the side at 31 and the first of them to pull on the claret & blue shirt some eleven and a half years earlier. His Burnley career saw him make over 470 first team appearances, 434 of them in the league. He scored just three goals, two of them in one season, but one of those three goals will be talked about as long as football is played at Turf Moor. Sunderland born Cummings played football locally for such as Hilton Colliery and Stanley United, and it was whilst with the Hilton junior team that he played in a tournament in France, his side selected to represent Great Britain. He impressed to such an extent that he was approached by scouts of a local club, but he returned to England where trials with both Blackpool and Spurs proved unsuccessful. That let in Burnley and he signed initially in October 1947 whilst also continuing his apprenticeship as a mining engineer. It took him just over a year to make the breakthrough into the first team. Captain and centre half Alan Brown had left the club for Notts County and full back Arthur Woodruff had been filling in. But a week before Christmas 1948 Tommy got his call up at Maine Road against Manchester City. Little could anyone have known then, but the first of our Championship team had taken his first steps in the first team and at the ground where we would celebrate one of our greatest triumphs. Tommy established himself immediately in the side and for the next seven and a half years he was one of the first names on the team sheet, either at centre half our full back. During that period he was called up by England and played at B level, although didn't ever win a full cap for his country. He played for the Football League and went on to become Burnley captain. But for all his achievements as a defender, it will be THE goal he scored against Newcastle for which he will always be remembered. I've had the goal described to me countless times, by my dad, other Burnley fans old enough to remember it, and by Tommy himself. I was exactly one week old when he scored it, a late winner six minutes from time that gave us a 2-1 win against the FA Cup holders. He won the ball on the edge of his own penalty box, robbing Jackie Milburn. Cummings, one of the quickest defenders in football, surged forward and beat every Newcastle player who tried to stop him. He finally took it past centre half Joe Harvey before unleashing a left footer into the top corner leaving goalkeeper Ronnie Simpson helpless. Friends of mine tell me that Billy Morris scored a very good goal that day, but the lasting memory is of Tommy's, incredibly his second that season having scored a late equaliser in the 2-2 home draw with Wolves earlier in the season. His only other goal came against Blackpool over ten years later. After playing regularly up until the end of the 1955/56 season he had to endure two full seasons virtually on the sidelines after suffering a cartilage injury. He played only occasionally in those two seasons but returned to the side in 1958/59 and kept his place. He started the 1959/60 season in the team at left back but lost his place to youngster Alex Elder, only regaining it when Bobby Seith fell out of favour. He came back in at centre half with Jimmy Adamson moving to right half. By the time we reached Maine Road he was a regular again and had played in over half the league games that season. After lifting the title he was in and out of the side again as Walter Joyce was introduced. He did play 34 games that season but missed out in all four of our European Cup ties with Joyce on the right and Adamson back in the centre. Off the field he was very much in the headlines. Jimmy Hill had chaired the Professional Footballers Association through the abolishment of the maximum wage. When Hill stood down Cummings was his successor during the 1960/61 season, a position he held until March 1963. However, a year on and he was back in the first team as the regular centre half in a season that saw the Clarets cruelly finish in second place in the league and runners up in the FA Cup. By now though, Tommy's Burnley career was almost at an end. He was in the first team for the first two games of the season but after the second, a 2-2 draw at Bolton, he was left out with John Talbut preferred. He didn't play again in the first team but had amassed no fewer than 434 league appearances and 479 in total. Only four players have ever played more league games for Burnley - Jerry Dawson, John Angus, Jimmy McIlroy and Alan Stevenson. In the summer of 1963 he left Burnley for Mansfield where he took up the position of player/manager. He didn't play too often but was in charge for four successful years that saw them promoted once and almost a second time. His record persuaded Aston Villa to appoint him as their manager in the summer of 1967 but he lasted just sixteen months before being replaced by Tommy Docherty. At that time he called time on his football career and started to call time in the pub trade. For years he was landlord at the Shooters in Nelson and then the Hare & Hounds at Harle Syke. More recently he was one of the match day hosts at Turf Moor, working alongside Andy Lochhead and Willie Irvine, looking after he corporate guests. He continued in that capacity until hit by ill health. He wasn't well enough to attend the Play Off Final at Wembley in May 2009 as the Clarets returned to the top flight and sadly, his untimely death on Sunday 12th July means he won't see Burnley play at the top level again. 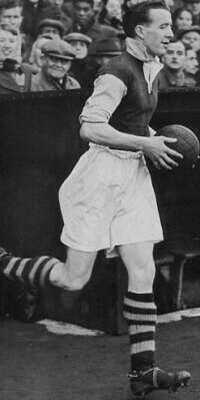 There is no doubt that Tommy Cummings was a great servant to Burnley Football Club, and make no mistake he was a top player for well over a decade in a Burnley side that first established itself as a first division team before going on to become Champions of England. He was a very good defender, a very quick defender too. His record at Burnley says everything about him as a footballer, but he was also one very nice man. The first time I met him was when I crashed my car right across from the Hare & Hounds one Sunday morning in 1985. Tommy came rushing out and offered me a brandy only to be told by one of his neighbours to take it back because it could get me breathalysed. A few years later he recognised me, remembering the crash, and told me to come up for that brandy. I did, and opted for a pint instead. A top player and a very nice man, his passing means it is a very sad day for everyone with any connection with Burnley Football Club. It is such a shame that he won't be around for this historic season, but as we celebrate the 50th anniversary of our title win I don't think the names of Tommy Cummings and Brian Miller will be far from our minds.